Suitcase Attaché gives users a creative boost by unleashing the power of typography in two widely-used applications. Whether you’re creating a corporate presentation or family newsletter, Suitcase Attaché enables you to ignore irritating and desperately dull system fonts like 'Comic Sans' and ‘Arial’ enabling users to set new standards with bold, strong typography. Extensis® today announced Suitcase Attaché™, a next generation font menu that unleashes the power of typography in Microsoft® Word and Microsoft PowerPoint®. 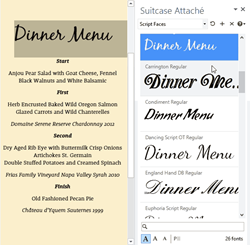 Available for download today, Suitcase Attaché connects users to all their fonts in a new dynamic panel where they can browse preview and apply fonts directly in these popular applications. Suitcase Attaché immediately expands font collections by enabling access to more than 1200 free fonts from Google® Fonts, opening options well beyond the norm. For users of Extensis’ professional font manager – Suitcase Fusion® – Suitcase Attaché automatically detects the Suitcase Fusion library and will auto-activate fonts from the collection. Suitcase Fusion users can also browse their full collection directly from Suitcase Attaché. Suitcase Attaché* is available for download for $20, and is offered in English, French, German, and Spanish. More information and a free 7-day trial download are available here. Customers who purchase Suitcase Fusion 6 will receive Suitcase Attaché for free, in addition to the latest release of FontDoctor ($70 value), the corruption fixing utility which helps keep font problems out of the creative workflow. *NOTE: Suitcase Attaché is available for Microsoft Word and Microsoft PowerPoint 2007 thru 2013 on Microsoft Windows only. © Celartem, Inc. d.b.a. Extensis All rights reserved. Extensis and the Extensis logo mark, Suitcase Fusion, Fontspiration, Portfolio, Portfolio NetPublish, Portfolio Flow and Universal Type Server are trademarks or registered trademarks of Extensis in the United States of America, Canada, the European Union and/or other countries. This list of trademarks is not exhaustive. Other trademarks, registered trademarks, product names, company names, brands and service names mentioned herein are property of Extensis or other respective owners. Microsoft, PowerPoint and Windows are either registered trademarks or trademarks of Microsoft Corporation in the United States and/or other countries.